Part Conveyors are simple, compact, modular, accurate reliable pneumatic gadget to remove components, sligs, shaving, pinching scrap from the bottom of the Die.They are belt-less conveyors and they transport the pieces with a shaking tray motion. A part customized tray fixed on the standard body with to & fro motion. The linear motion moves tray slowly forward and then quickly backwards. This motion pushes the components & scrap outside Die area into container. • Pay - back period is less then 1 year. B. Compared to motorized conveyors, it has following advantages :- Replacement cost of belts, conveyors, bearings, justifies this low cost part Transporter on the conventional belt conveyors. It separates each element scrap, part and in larger models two or more customized traya can be used to separate each element coming out from punching. This saves additional investment cost. Two/Three trays in parallel or one above another can separate the element for most cleaner operation. Additional Application :- Today Part Transporter is replacing conventional belt conveyor in assembly type operations to move parts. 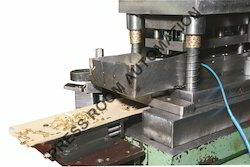 Part Conveyor can be easily mounted on press below the die or with the help of plate type stand at the side. Part Transporter is replacing conventional belt conveyor in assembly type operations to move parts from the dies. Operating with the help of air, this are the most economical way to remove material from the die. Part Conveyor with various Tray Attachments can be mounted as shown to take scrap at different location is die. We are the supplier of the Part Conveyor to our clients. Looking for Part Conveyor ?